Overtaking imports, India's steel exports jumped by 150 percent in February over year-ago month and the country shipped out 6.622 million tonnes (mt) of steel in April-February period of the current fiscal, up by 77.6 percent over the same period last year, a steel ministry report said. "Export of total finished steel was up by 77.6 percent in April-February 2016-17 at 6.622 mt over same period of last year. Exports in February were up by 150 percent over February 2016 but declined by 15 percent over January 2017," said the report of Joint Plant Committee. Imports of total finished steel in the first 11 months of the current fiscal declined by 38.5 percent to 6.591 mt over same period of last year and in February only, imports were at 0.491 mt, down by 46 percent over same month last year. "Given such trends in export-import, India emerged as a net exporter of total finished steel during February 2017 as well as April-February 2016-17," the report said. According to it, India's consumption of total finished steel at 76.229 mt saw a growth of 3.4 percent in April-February period in 2016-17 over same period of last year. Consumption in February, 2017 at 7.334 mt was up by 3 percent over corresponding month last year and but declined by 0.2 percent over January, 2017. Production for sale of total finished steel at 91.846 mt, registered a growth of 11.1 percent during April-February in 2016-17 over same period of last year. 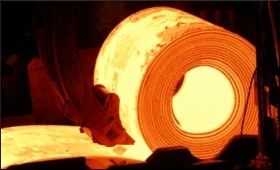 Overall finished steel production for sale at 8.838 mt in February, 2017 was up by 13 percent over year-ago month but declined by 2.3 percent over January 2017," the report added.